Where do I use my 365 Tickets voucher code? Add the tickets to your basket you would like to purchase. Visit the basket page by clicking the basket icon in the top right corner of the page. At the basket page, you will need to select a delivery option followed by ticket protection. Now you can select a payment option of your choice. You will now find the following text ‘Voucher code (if applicable)’, click the text to reveal a box. You order total will be updated with any discounts or offers. "Up to 50% off in the offers section." 365 Tickets provide attraction tickets for special days out in the UK, Europe and the US, with access to theme parks, sightseeing, heritage sites and more available at fantastic low rates. Disneyland Paris is a magical land where dreams come true. Here fun and entertainment stay open day and night in a resort as big as imagination itself. With 365 Tickets the magic is closer than you think. You can find discounted tickets and offers as well as additional discounts available for groups of 12 or more. Check out 365 Ticket's Disneyland Paris Special Offers page, to enjoy even more savings! Or visit our deals page where you can find all the best Disneyland Paris offers from 365 Tickets all in one place! Drayton Manor Park is the UK’s Theme Park of choice – and one that the whole family is certain to enjoy! Set in 280 acres of scenic parkland and lakes, the Park combines heart-racing roller coasters, novel children’s rides and impressive water rides in a world of non-stop fun. This theme park is fantastic and will ensure top family fun like no other. With 365 Tickets heading here with the family doesn't break the bank like you might think. Buy with 365 Tickets and enjoy big discounts and online savings that you won't find anywhere else and head to Drayton Manor for some great family bonding time with the kids. If you're after a voucher code for 365 Tickets then you're at the right place. Here at NetVoucherCodes, we list all the best voucher codes and promotions for 365 Tickets so you can save money on a variety of tickets to attractions and places across the UK and Europe! With us, buying tickets doesn't need to cost a bomb, we ensure we have the best deals available so you can save as much money as possible when placing an order online. How can I contact 365 Tickets? What if I've lost my tickets or they've been stolen? In the majority of cases, actual hard copy tickets cannot be re-issued if lost or stolen. It may be possible that the tickets can be voided although this process may take several weeks. To request a cancellation please contact 365 Tickets by email. 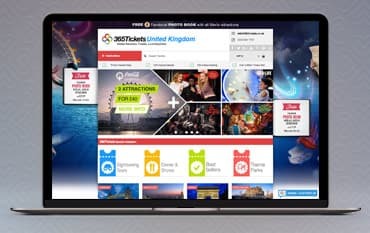 365 Tickets sells e-tickets to over 300 visitor attractions and theme parks from around the world including Disney World & Universal. Save by using 365 Tickets discount codes to get a great saving on your tickets. With tickets to theatres, attractions, theme parks, tours, exhibitions, heritage sites and so much more you can be sure of a great day out for less.